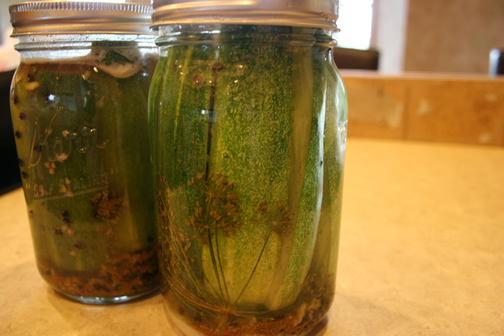 Place salt, peppercorns, coriander seeds, garlic and dill in a sterilized 1-quart Mason jar. Layer sliced cucumbers in jar, leaving 1/2 inch at the top. Fill jar with water, seal with lid and shake for about a minute. Refrigerate for six days, shaking daily. Makes 1-quart jar of dill pickles. Mmmm, I'm going to give this a try!